The past few weeks have tossed strange prepositional anomalies in my path. Or perhaps every week does so, but I have just taken to noticing them recently. The three-year-old who lives nearby likes to announce, “At my birthday, I’m going to…”, or “Can I have that at my birthday?” On the classic rock station, I heard an early 70’s number 1 hit, “A Horse with No Name,” by the group America. Strangest amalgamated preposition you’ll find: “In the desert you can remember your name, ‘cause there ain’t no one for to give you no pain”. Forget the triple negative, it’s that “for to” that leaves you wondering how far the exigencies of meter should nudge a songwriter toward agrammaticality. On the street car, I heard a kid announce to his companion, “At least I’m done my homework!” Shouldn’t there be a “with” in there somewhere? And as we gear up for the summer Olympics, I expect to be hearing many, many times broadcasters using the phrase “In an hour from now” (e.g., “We will be poolside for high diving in an hour from now.”) To my ear, though, “in an hour” all by its lonesome can hold up just fine the structure that precedes or follows it. The author presents studies that have discovered fascinating correlations between high and low usages of particular types of function words and gender, age, personality, and social status. For example, people who use more articles (a, an, the, in English) are likely to be “more organized and emotionally stable”, “more conscientious, more politically conservative, and older” (p. 37). Women use the first-person pronoun “I”, cognitive words (such as understand, know, because, reason), and social words more than men, who use more prepositions and nouns. 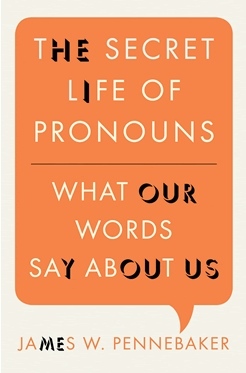 The use of pronouns most reliably reveals social status. Those higher in status use much fewer “I-words” (I, me, my), more “we-words” (we, us, our) and “you-words” (you, your) (p. 174). Different emotional states are also associated with particular patterns of function word use: positive emotions are linked to greater use of “we” and concrete nouns. Sadness is linked to higher rates of saying or writing “I” and the use of past or future tense verbs. When angry, people use “you,” “he,” “she,” and “they” more, and rely more on the present tense. Pennebaker also discusses efforts at lie detection through linguistic analysis, concluding that we should be skeptical of any analytic process that claims to exhibit greater than about 65% accuracy. However, he does present an interesting table (p. 162) that classifies several words that tend to be associated either with honesty or deception. Later chapters examine the language of leadership, of love, and of group identity, and how computational author identification works. The author also discusses the science of linguistic style matching or verbal mimicking. And what of the lowly preposition? Well, it’s not so lowly, it would seem. Prepositions are associated with “complex thinking”. This type of thinking, notes the author, involves “bigger words, longer sentences, and more complicated sentences, often involving prepositions... Prepositions, by the way are glorious language markers. They help to situate an idea in time and space” (p. 296). So, the prepositional anomalies I recorded might reveal a few things. The three-year-old's birthday-themed prepositional "at" likely just reveals that, well, she's three years old. It takes children a long time to acquire skillful usage of the prepositions, even in their first language. I'm guessing that the joyful preposition-dropping declaration on the street car probably would tell a member of Pennebaker's research team that the child is a Canadian. And maybe broadcasters subconsciously achieve a bit more status in the minds of the viewers if they shingle more prepositions than are absolutely necessary into their announcements. As for the group America's "for to" excursion, I haven't a clue what to make of that. I'm willing to bet, though, that Pennebaker and his research team would. A little respect then, for the humble to, of, in, for, with, on that made it onto the top-20 most frequently used words list, and for all those prepositions that didn't. They, and other function words, are telling our secrets.